Christopher found his perfect car in a Rover 75 (R70 FVE) in July 2005 after a succession of meaningless connections with Ford cars and an odd phase when he drove a Datsun Sunny Station Wagon in deepest darkest New Zealand! He originated from sunny Malta and is a biomedical engineer by profession, he spends his days devising new and exciting ways of measuring the outputs of people's brains (it is easier in some than in others!) has a New Zealand born son and a Canadian born daugther. Together with his 8 cats and 1 (slightly nervous) cockatiel they all live in Rugby. He now spends his weekends trying to make R70 FVE shine even more than it does and adding that ultimate accessory. For the club he sorts out the webpages and administers the running of the site. Well known for many things, and pretty much none of them pleasant or printable, Pete was the creator of the first web site for the club. His Rover 75 was in fact a landmark as it was the first purchase he made of notable taste. Sadly he has been unable to repeat this feat to date. After an extended period away Pete has returned to the club, his 75 now accompanied by a ZT. Reebs, or Paul to his friends, first came into Rover 75 ownership in 2001 with the purchase of a pre-launch Copperleaf Red Connoisseur SE. Thoroughly smitten, he then changed it for the first of what would become four Monogram Lagoon Supertallic cars. The V6 derivative seems to run in his blood, as three have a 2.5 KV6 power plant under the bonnet, and one has a mighty 4.6 litre motor. Paul says, the only problem these days is deciding which car to take, the smooth elegance of the 75, the sporty practicality of the ZT-T 190 tourer, the more modern styling of the ZT 180 Sports Auto, or the sheer muscle power of the ZT 260 V8. and his trusty 1.8 ZT in Monogram Sunspot Yellow. The Flying Banana is always a welcome sight on the highways and he is known country wide as he travels to many meets a year. Stuart or Fusilier as he’s known to club members following his 23 years in HM Forces is on to his second MG ZT. His first, a Raven Black 160 +, was bought in 2004 and that was followed by a Trophy Blue model of the same specification. Graham Cruickshank was delighted to represent Scotland East area of the club as Regional Secretary. He is no stranger to being behind the wheel as he works for Lothian NHS as a driver which includes patient transport, delivering meals and pharmacy items. Greeners or David as he was named by his parents is a man of many talents. In his time he has been a telecoms analyst, a florist, and an incident manager on the M25. 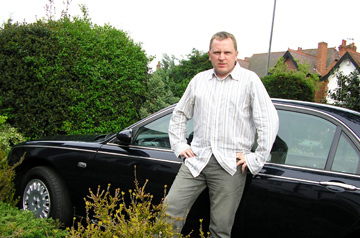 No stranger to the MG Rover brand, his first purchase was a Trophy Blue ZT 190+ saloon when he joined the club in 2007. From there he acquired a Midnight Blue V6 ZT-T, and then took the plunge switching to a Starlight Silver MG ZT 260 V8 beast which he lovingly cherished for 2 years. These days, David’s preferred mode of transport is a ZT CDTi diesel saloon finished in wonderful Monogram Chagall Supertallic paint. His knowledge of these cars is legendary within the club and his 13,000 plus posts are a testament to his commitment and willingness to help other members keep their cars on the road. Simon has driven MG Rovers for the past 10 years and is now on his third model - a rather tasty ZT 190 SE. Prior to this he drove a 1.8 Classic SE which he had for around 6 years sadly it has now gone to the great garage in the sky. actros acquired his name from years of driving articulated lorries, but these days Brian helps the club by representing the Yorkshire members by helping to organise local meets in that part of the world. Brian joined the club in 2006 and was quickly asked to take on the role of parking marshal at our national meets, he also manages the Club Shop. His current car is a 75 Connoisseur SE 1.8 in Odyssey Blue. It’s his fifth Rover 75 as he’s previously owned three saloons and a tourer. Andy currently drives a Starlight Silver Rover 75 Connoisseur SE 1.8 as well as a 75 Connoisseur SE V8 in Odyssey Blue. Over the years he has owned a variety of Rovers including P4's a P5B and other marques, a Jaguar S type, E type, 1964 mustang convertible and a 2004 Mustang GT. He says his favourite has to be the E-Type, a real head turner but not so good if you suffer with back problems! Cars are Andy’s passion and even from a very young age he was involved in stock car racing. His next project is to build a Cobra replica. Andy is the Regional Secretary for the West Midlands. 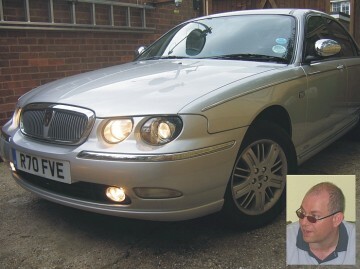 Chris bought his first Rover 75 in February 2008. A tidy low mileage Club SE Auto with 37k on the clock. Currently he drives a W Rover 75 2.0 V6 LPG Classic SE Auto that he bought as a 1 owner car from the family of an elderly gentleman in Birmingham who sadly passed away the car having covered only 17k with full, annual service history. Over time Chris has upgraded it to Connoisseur spec which included a wood rimmed steering wheel and Naval Double Din head unit amongst other things. John has been a member of the club since it’s inception, and has taken his treasured ‘Blue’ to virtually every national meet we’ve held. His Royal Blue Club SE is a 1.8T auto, and has to be one of the most pampered cars in the country. John’s wife Jan has now also joined the ranks of 75 ownership with her Starlight Silver V6 saloon called ‘Silvervixen’. Since becoming a regional secretary for the Cumbrian area, John’s passion and enthusiasm for the marque has grown yet further, organising some celebrated gatherings for the members in his region. Matt has been a huge fan of the 75/zt since a neighbour gave him a lift in his 1.8 classic, and Matt always said he’d own one, now after saving nine and owning over twenty of them, they've got under his skin. Matt currently owns grovey the orange grove ztt and is in no hurry to change it, this car was the first he spotted on the forum and he promised himself one day he’d own it, two missed sales and three years later she came home. Colin has an extremely understanding wife and a obsession for everything MG/Rover, he's now on his 9th ZT and 7th 75 since 2009. A love only rivalled by his pride of the home country he loves dearly. He currently owns a yellow ZT-T 190, two Rover 75's in v6 saloon and diesel tourer form, along with a Rover 25, Rover 45, concourse condition 1994 Rover 214 and a Freelander. Situated in central Northern Ireland outside Antrim, he continuously works with many local charities, car shows & owners clubs to arrange enthusiast family friendly or petrol head dedicated events throughout both NI and the Republic of Ireland, cumulating each year with the annual Irish owners day at Tullymore Forest, Newcastle on the last Sunday of each August. If you happened to need some advice on buying a car, he compiled the "Rover 75 and MG ZT Ultimate Buyers Guide" and happily helps local owners out with their car problems at nothing more than the cost of a doner kebab, with house sauce and a portion of chips! As a regional secretary Stuart has helped organise several meets including three Father’s Day Rallies at Harewood House near Leeds, where club members had their own section within the larger event. Peter is a retired purchasing professional and has been married to his wife Sheila for 43 years. Both are avid London Welsh Rugby Fans. As well as organising meets for the South and West area of London, Peter is a keen Cyclist and owns ten plus bikes. (Apparently he can only ride one at a time !!!) When he's not driving in his Royal Blue diesel tourer, Peter loves car booting and Barney Bodging! Bernard has driven many Rovers in his time from 214's to 420TD's, but he says his two 75’s are in a league of their own. As well as his Wedgwood Blue Connoisseur SE diesel saloon, he also owns a very shiny British Racing Green Connoisseur SE tourer which once belonged to a fellow club member. Bernard became a regional secretary for the club in 2012, and is eager to help co-ordinate meets and events for members in Sussex and Kent, as well as helping with advice and support for anyone that needs it. Bonnie has owned a 75 since 2015 but has always had a love for Rovers being brought up in a family that has been on the Rover scene as far back as the early 90’s. As well as her White Gold 75 2.0 CTDi Auto club she has a Rover 200 BRM which shares the drive with four other BRM’s belonging to her partner Alan. Bonnie is out a lot in show season all over the country and always gets lots of nods and waves from other MG Rover owners whilst on her travels.